The Prionailurus Genus includes five species of small cats that are native to Asia. Prionailurus viverrinus, or fishing cat, can be found in south-east Asia. The five extant species of small cats of the Prionailurus genus are native to Asia. The Prionailurus planiceps is one of the five species of Prionailurus that is found on the islands of Borneo, Sumatra, and the mainland area of the Thai-Malay Peninsula. Within its range, the species inhabits lowland tropical rainforests and prefers to live in freshwater habitats. As the name of the cat suggests, the flat-headed cat has a highly depressed skull with the depression extending along the nose to the end of the muzzle. The cat also has very long canine teeth. The color of the fur varies from reddish-brown at the head to a dark roan brown at the back. The chest is white and the belly is mottled white. The chin and muzzle are also white. The size of the cat ranges from 41 to 50 cm. 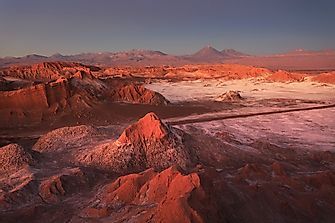 The species is solitary and nocturnal in nature. Fish constitute the majority of the diet of this cat. 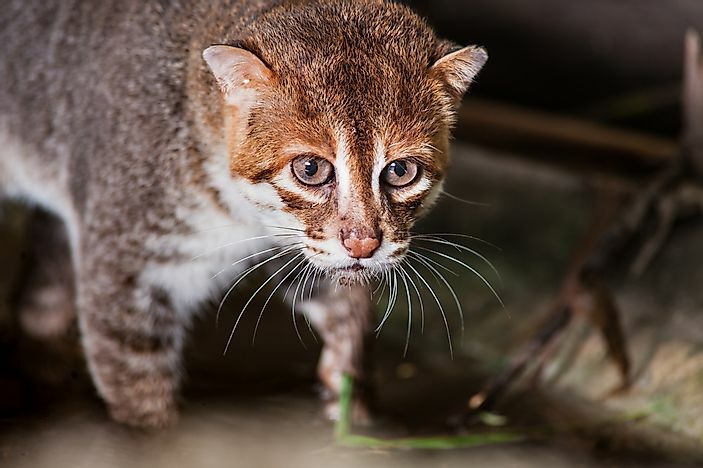 The flat-headed cat is currently classified as Endangered by the IUCN as the massive destruction of wetlands in the range of this species has drastically reduced the population of the species. 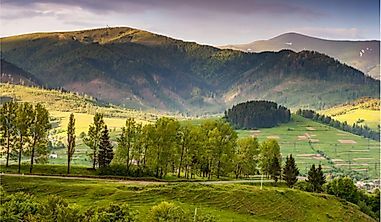 The Prionailurus rubiginosus is a small cat of the Prionailurus genus that lives in the dry and moist deciduous forests of India, Nepal, and Sri Lanka. The cat is only about 35 to 48 cm in length. The fur of the cat is mostly gray with rusty spots on the sides and back. The undersides are white with dark spots. The face features six dark streaks on either side of the head. Two subspecies of the cat are Prionailurus rubiginosus rubiginosus and the Prionailurus rubiginosus phillipsi. 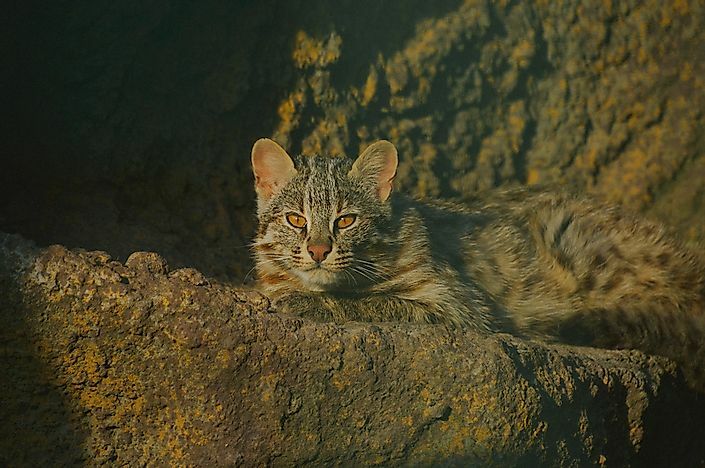 The rusty-spotted cats feed on rodents, birds, lizards, etc. Little is known about their behavior due to their nocturnal and elusive nature. The species is labeled as Near Threatened on the IUCN Red List as habitat fragmentation and destruction act as threats to the wild population of these cats. The Prionailurus viverrinus inhabits the wetland habitats of South and South-east Asia and are found near rivers, lakes, streams, marshes, and mangroves. The cat is the largest species of Prionailurus and has a length ranging from 57 cm to 78 cm. The fur of this species is ashy-gray to olive-gray in color on the dorsal surface and the underside is white. Two dark stripes run along the cheeks and four stripes extend from the top of the eyes to between the ears and reaching the shoulder. The shoulder features dark stripes whereas the flanks and sides have oval or round shaped spots. The fishing cat is primarily a solitary and nocturnal animal. It is also an excellent swimmer and can even swim under water. Fish constitutes the main diet of the cat but it also preys on rodents, birds, insects. Occasionally, the cat also consumes carrion, amphibians, and reptiles to supplement the diet. 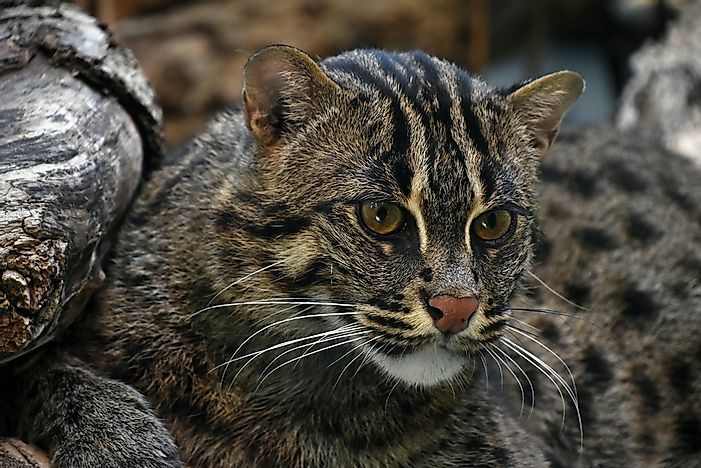 Currently, the IUCN recognizes the fishing cat as a Vulnerable species as persecution by humans and habitat destruction have triggered a decline in the population of this species. 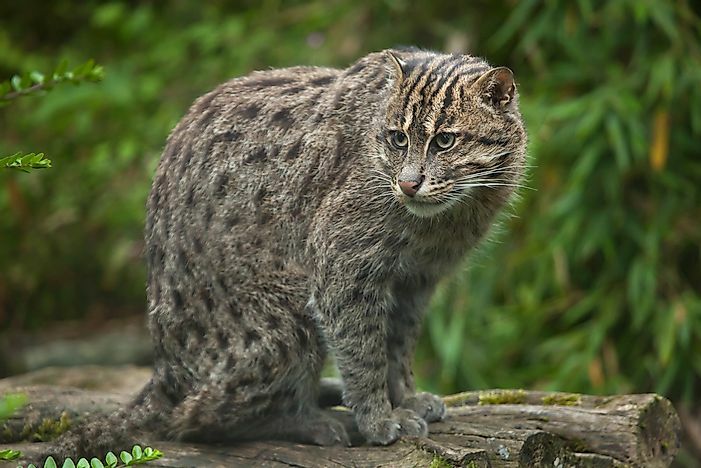 The fishing cat is the state animal of the eastern Indian state of West Bengal. The Prionailurus bengalensis is a Prionailurus species that is widely distributed throughout South Asia, East Asia, and Southeast Asia. 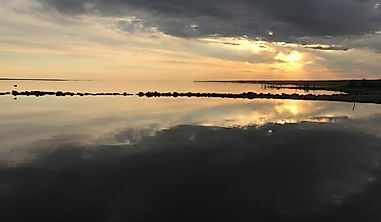 Within their wide range, they inhabit a variety of habitats including tropical evergreen forests, coniferous forests, and subtropical deciduous forests. 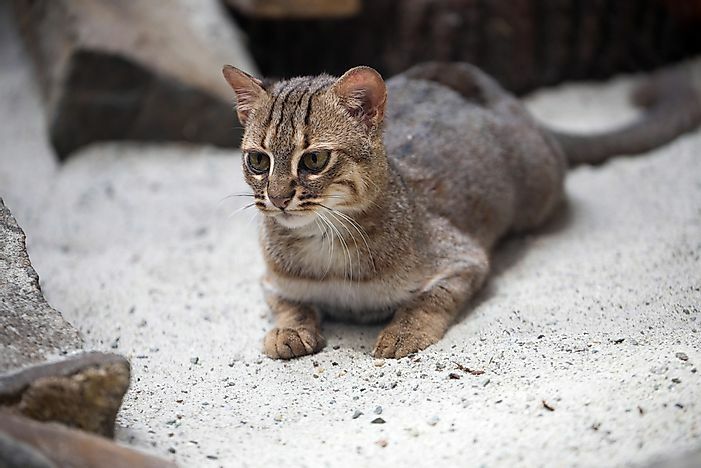 The leopard cats also live in habitats modified by humans like sugar cane and palm oil plantations. The leopard cat is more slender and has longer legs than the domestic cat but both are nearly of the same size. The white muzzle is short and narrow. The head of the cat features two dark stripes running from the eyes upwards and two dark stripes running from the corners of the eyes towards the ears. Short, white stripes run from the eyes towards the nose. The tawny fur at the back is marked by differently sized black spots while the undersides are white. The tail has a black tip and indistinct rings towards the tip. The length of these cats ranges between 38.8 and 66 cm. Two subspecies of the Prionailurus bengalensis have been recognized, the P. b. bengalensis and the P. b. euptilura. The leopard cats are primarily nocturnal and solitary in nature. They hunt and prey on small mammals, birds, amphibians, and insects. The cats are excellent climbers and often spend long hours atop trees hunting beetles and rodents. Although this species is recognized as a Least Concern species due to the wide distribution, it faces considerable threats to survival. The Prionailurus javanensis inhabits the lowland tropical evergreen forests and certain human-modified habitats of the Sundaland islands. 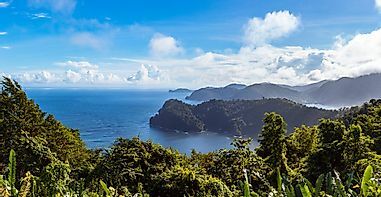 The range of this species includes the Philippines, Borneo, Sumatra, Java, and Bali. The Sunda leopard cat is slightly smaller than the domestic cat. The size of this species ranges from 38.8 to 66 cm. The upperparts of this species are gray-brown colored while the underparts are whitish. The back has round brown spots. A black line extends from above the eyes to the back. The white muzzle is narrow and short. The head features two prominent dark stripes. The spotted tail has dark indistinct rings and a black tip. Five subspecies of the Sunda leopard cat are P. j. javanensis, P. j. sumatranus, P. j. borneoensis, P. j. heaneyi, and P. j. rabori. These cats feed primarily on rodents and occasionally on geckos and amphibians.